Boquete is a town in Panama with an aura of a place which cannot be skipped when in this Central American country, and when we arrived on one late afternoon when the high season was in full swing, we couldn't believe how many western travelers and backpacker we met all of a sudden. It was something new to us as we hadn't seen that many tourists probably for a month. The last tourist place we visited was Rio de Janeiro, but we surely did not expect to come across that many people in a small town close to borders with Costa Rica. But the number of visitors should not put you off from visiting this pleasant town. There are so many things to do that the crowds disperse every morning and return back to the town for dinner in the late afternoon. The range of activities is so broad that for most of the day you will wonder where all those people have gone! But not only one-time visitors discovered the charm of Boquete, rather the contrary. Cooler temperatures, fresh air, slow-paced lifestyle and beautiful beaches of Bocas del Toro within driving distance attract foreigners, especially Americans who are arriving in Boquete to retire here. Boquete is so popular that in the past decade the town became one of the best-known places among expats. Well, we don't see ourselves moving to Boquete, but still, the number of US citizens in the town surely affected our visit, even when we spent only three days there. Lots of hotels and restaurants are owned by Americans, so it means two things. You can find here food you are familiar with (bread and pizza), but prices are higher than in the rest of Panama. Boquete in Chiriqui province is exactly the town you can base yourself for a week or more, and you will still have plenty of things to do and try so you could tick them off from your bucket list. But as we know, the average traveler spends two or three days in this lush mountainous town, so we've put together a list of the best things to do in the area, and hope it will come handy and make your travels easier. The number of hikes close to Boquete town doesn't leave any doubts about the fact that this town is the adventure and hikers capital of Panama. Come and see by yourself. If you would enjoy Boquete, we can also recommend you visiting El Valle de Anton, another outdoor and adventure town in Panama. All hikes are easily accessible from Boquete by one of the regular collectivos leaving from an official spot close to the market, or if you are traveling in a larger group, it is worth to hire a taxi. There are several popular trails which usually require at least a half day of your time, for example, Pianista Trail, Pipeline Trail or Quetzal Trek to name a few. We did the Quetzal Trek, the trail leading through dense forest offering several vistas of cloudy mountains around, and also an opportunity to spot elusive Quetzal bird. Striking green and red Quetzal bird is the national bird of Guatemala but lives in the area of Boquete as well. The best place to look for this colorful bird with bright feathers and the long tail is on the Quetzal Trail, but you can try your luck basically anywhere around. To increase your chances, it is better to hire a specialized guide, because treetops in the forest around Boquete are high, and it is not easy to spot the bird when you don't know where to look and what signs to look for. We were not lucky in Boquete but had an opportunity to take great photos of Quetzal birds in Monteverde, Costa Rica. Among the most popular adventures in Boquete belongs the sunrise hike to Baru Volcano, with 3475 meters the tallest mountain in Panama. When the weather is clear, you can see both the Pacific and Carribean Ocean from the summit, but unfortunately, this does not happen that often as Baru Volcano is often shrouded in clouds. If you want to conquer Baru Volcano, be ready for a challenging hike which is not technical, but is long. You need to leave Boquete before midnight in order to reach the summit before sunrise. You can get to the start of the trail by taxi, but it is cheaper to book a shuttle in Mamallena Hostel. From the trailhead, it is 13 kilometers long hike in the dark on the road. Take lots of water and wear layers as it is cold and windy on the top. If you feel like climbing the volcano would be out of your depth, you can take a tour from Boquete as there is a road leading to the top of the volcano. To know more about coffee, you don't need to visit Colombia, although we highly recommend it. Boquete is a world-known destination producing one of the best coffees in the world. You can visit plantations and farms in the area of Boquete where you can see how the coffee grows, farmers will explain the whole process from the bean to the cup of coffee, and of course, you can taste as many varieties and as many cups you please. Have you ever heard of Geisha coffee? If not, it is the time to learn more about it here in Boquete. This rare variety is expensive and the most sought-after coffee been you can come across in Panama growing on the slopes of Baru Volcano. Pump up the adrenaline in Boquete and sign up for white water rafting tour as soon as you can. Chiriqui province offers world-class rafting. During the tour, you will have a chance to enjoy an unforgettable ride plus there will be time to admire Panama's biological diversity from the raft. Chiriqui Viejo River flows fast even in the dry season from December to April, so you don't need to worry that the experience won't be the same as in the wet season. One of the most reliable tour companies arranging the tour is Boquete Outdoors Adventure. Canopy tours became over-popular in South and Central America and you can try this adventure almost everywhere, but on their defense, we must say that conditions are perfect here. It is another way how to enjoy the forest, and if you are not fond of hiking, this might be the right activity for you. Very often, ziplining can be combined with waterfall-ing or canyoning, we experienced it in Jaco, Costa Rica for the first time, and we had so much fun. Coffee and chocolate business usually goes hand in hand, and Boquete town is no exception as it offers several interesting chocolate or chocolate-making tours. We haven't done it here in Boquete, as we've done a similar activity in Mindo in Ecuador, but you should not miss it if you are a chocolate lover, and honestly, who is not. Similar to Volcan Arenal or Monteverde in Costa Rica, you can enjoy hanging bridges in Panama's Boquete as well. Make sure you don't suffer from hights, otherwise you won't be able to enjoy this activity fully. Cloud forest is a specific environment on its own, and hanging bridges will help you to get closer and admire the unique flora and fauna. One of the most rewarding hikes in Boquete is The Lost Waterfalls Trek. The trek is privately owned, so you must pay $7 to enter the trail, but you'll be soon rewarded with three waterfalls on a very short distance. This trek is suitable and easily accessible for everyone, kids, or elderly. The accommodation in Boquete expands, and you don't need to worry that you won't find a room in the town, but if you don't book well in advance, especially in high season, all options within your price range can be gone, so plan ahead. Budget | Hostel Mamallena Boquete - So far the most popular option for backpackers in the town. This hostel offers private rooms and dormitories as well plus the staff speaks English well and can arrange tours or transport to other destinations within Panama. Mid-range | Casa Azul Bed & Breakfast - Beautifully decorated place with a special atmosphere is the best you can find in Boquete when you compare the price and the service. Luxury | Hotel Panamonte - Luxurious and spacious rooms offer a terrace with garden and mountain view, free breakfast and fast wifi. 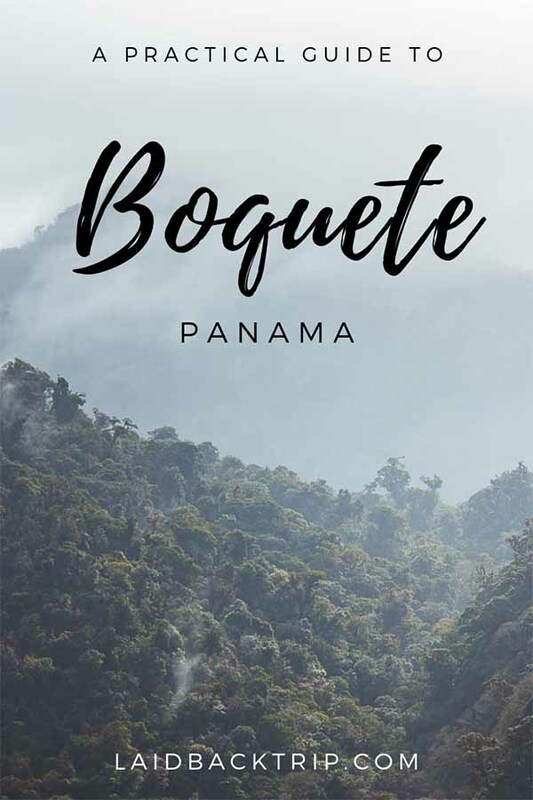 Boquete is off the main highway running through Panama, and when traveling by bus, you need to get to the city of David first - it is also the city you must pass through if you are planning on crossing borders to Costa Rica. David is easily accessible by public transport from Panama City, Santiago de Veraguas or El Valle de Anton (you need to get from El Valle de Anton to the main highway, you can read more about it in our full post about El Valle). From David, regular buses (approximately every 30 minutes) leave the bus station to Boquete. The ticket cost $2.5, and the ride takes about 45 minutes. Boquete is a small town close to borders with Costa Rica, and overall it is a really safe destination. The petty theft usually doesn't occur here and the chance you would encounter any unpleasant situation in the town is very unlikely. You should be careful when going hiking on own as the area can see flash floods, plus you should never leave the trail. In case you are not sure about your navigation skills, do not hesitate to hire a guide. In 2014, two Dutch girls went missing when hiking one of the most popular trails, El Pianista trail, and were found dead several months after. Until today, no one knows if it had been a tragic coincidence and they got lost, or if there was a third person involved, so be careful. It is always better not to do outdoor and adventure activities on own. In 2016, an American tourist was murdered on Bocas del Toro islands, and later on, FBI was investigating these two incidents as there might be a connection between them.